After crushing top-25 ranked George Washington (3-1) 84-63 over the weekend, No. 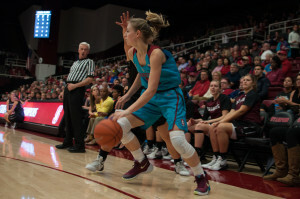 13 Stanford women’s basketball (3-1) fell on Monday — despite a late comeback attempt — to unranked Santa Clara (2-2) 61-58, marking the team’s first loss of the season. While Saturday’s defeat over the Colonials was the program’s largest over a top-25 opponent since the Cardinal beat Penn State by 25 in the 2014 NCAA tournament, Monday’s loss against the Broncos signified the first home loss Stanford has suffered to an unranked nonconference opponent since 2007, as well as the first time Santa Clara had won at Maples since 1984 and the first time the Cardinal lost to the Broncos since 1998. 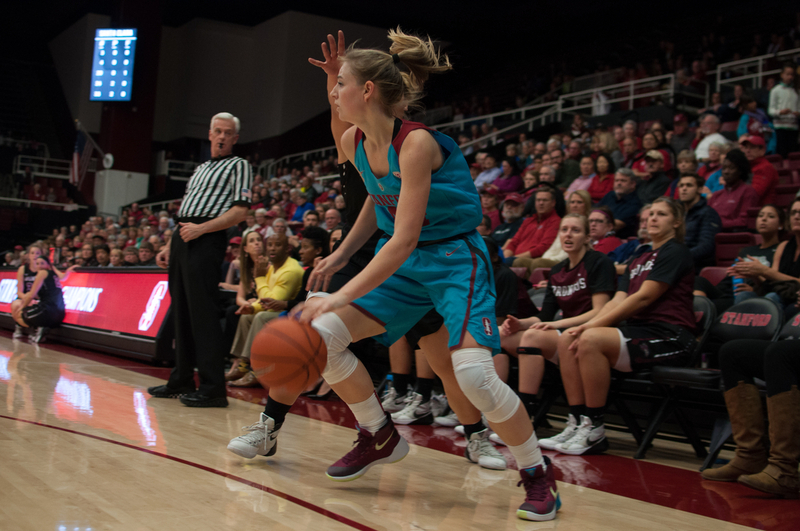 Against GW, Stanford started slowly, as the team had done in its first two games of the season. A 3-pointer from Jonquel Jones with 3:31 to go in the first period gave the Colonials an 8-point lead, the largest lead they would have in the game. Jones was a force to be reckoned with in that quarter, scoring 15 of her 27 points, while the team overall shot 8-of-18 to kick off the game. Stanford was able to improve its defense and get going offensively, tightening the score and only trailing by four after the first 10 minutes had expired. But the second quarter was when the team truly took control of the game: The Cardinal outscored GW 31-11, with 29 of the team’s points coming from junior Lili Thompson, junior Karlie Samuelson, junior Erica McCall and freshman Alanna Smith. Stanford went into halftime with a 16-point lead and never looked back, leading by as much as 24 and as few as 10 for the rest of the game. “The second quarter was how we want to play, just really get out and run, move the ball and that’s something we’re working on real hard,” said head coach Tara VanDerveer after the game. After dealing with a minor injury for her first two games, Thompson finally started her first game of the season and scored at least 20 points for the second consecutive game, ending with 21 points overall. McCall was also able to get things done in the post, notching 18 points and 10 rebounds as well as her third double-double in as many games. “Bird is playing great — double-double machine,” VanDerveer said. Samuelson also went 4-of-6 from beyond the arc, ending the game with 17 points, while Smith also made it into double figures with 10 points. Despite an impressive showing against a high-caliber team in GW, Stanford came out a few days later the flattest it has looked in years against Santa Clara. Both teams scored 8 points — yes, eight — apiece in the entire first quarter, in which Stanford nearly had as many turnovers as it had points (7 vs. 8). The Cardinal shot 2-of-12 from the field and got their other three points from free throws. Things looked a bit better for Stanford in the second quarter, as the team scored 14 points, seven of which came from Thompson, but the team remained tied with Santa Clara going into halftime. Even after the break, Stanford got out to an early 27-24 lead off a layup from freshman Shannon Coffee, but the Broncos weren’t going anywhere, forcing more Stanford turnovers and going on a 17-6 run to end the period. After Stanford’s offense finally looked like it had some life back in it, some free throws from Samuelson and junior Briana Roberson forced ties on two separate occasions in the fourth quarter. The Cardinal defense could not stop Santa Clara, however, instead allowing the Broncos to take a 57-50 lead with a minute to play. Two 3-pointers in that span from Samuelson and Thompson and a layup from McCall threatened to close the score gap, but the Broncos would make the free throws they needed to to win the game. In addition to its abysmal shooting and defensive struggles, turnovers, as a result of the Broncos’ zone defense, proved to be the most costly for Stanford, as the team had 26 total that led to 24 points for Santa Clara. Despite the disappointing loss, McCall had another solid night, earning her fourth double-double in as many games with 12 points and 11 rebounds. The team also donned turquoise uniforms to honor Native American Heritage Month as part of Nike’s N7 Project. The team will look to rebound from this setback when it travels to Florida to participate in the Gulf Coast Showcase, with its first opponent being 2-2 Missouri State. Missouri State, part of the MVC conference, has notched wins against America Nazarene and Ole Miss and has lost to Oklahoma State and Missouri so far this season. VanDerveer will look to have more of her team’s offensive weapons firing early and often: While Thompson, McCall and Samuelson have averaged over 10 points per game over the past four games and are fairly consistent, Roberson and Smith are capable of contributing more as well, and if sophomores Brittany McPhee and Kaylee Johnson can get involved on the boards and with scoring, Stanford may be able to showcase the potential of its young but talented team. Tipoff will be Friday, Nov. 27 at 10:30 a.m. The game will be broadcast via Stanford Live Stream.